These are mini cupcakes coated in semisweet chocolate and made in a mini muffin tin. Coat a small cup muffin tin with cooking spray. Prepare the chocolate cake mix according to package directions. In a microwave safe bowl, microwave chocolate with butter and oil, stirring often until melted. About 1 or 2 minutes. Add about 1 tbs of the prepared cake mix into each muffin cup. Pour about a tbs of the chocolate mixture into each muffin cup. Melt peanut butter in microwave, 30 to 40 seconds. 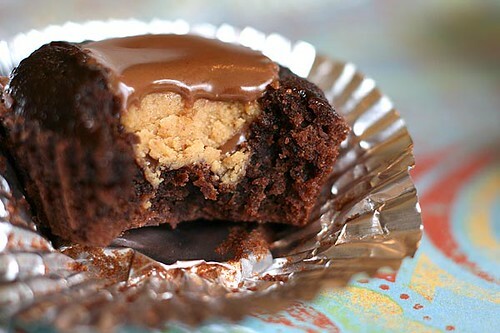 Spoon about 1 tsp of melted peanut butter over the chocolate in each muffin cup. Top with another tbs of chocolate. Chill in refrigerator for 30 Minutes or until set.